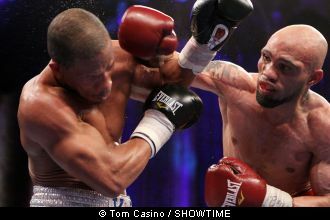 Ishe Smith claimed a split-decision victory over Cornelius Bundrage to win the IBF light-middleweight world title. Smith outworked the hometown favourite in Detroit to earn the win by margins of 116-111 on two of the judges' scorecards, while the third saw it 114-113 for Bundrage. The 34-year-old, who is promoted by Floyd Mayweather, improved to 25-5 with 11 wins inside the distance as he became a world champion for the first time. "It means everything. I didn't think I'd be here man," said Smith, who admitted that he once contemplated suicide as his career and personal life went off the rails. Bundrage was the aggressor for most of the bout as he kept Smith on the back foot with his jab, but the younger fighter came on strong in the later rounds. Smith rocked Bundrage with a flurry of shots in the ninth round and went on to close out the win despite the champion enjoying strong support from his local crowd. Bundrage said: "Ishe just fought a good fight. He won the fight fair and square. I didn't follow instructions. He won it. He won the fight. Congratulations to him." DETROIT – Ishe Smith captured the IBF Junior Middleweight World Championship and became the first Las Vegas native to win a major world title when he scored a split decision victory over Cornelius “K9” Bundrage in the main event of a special edition of SHOWTIME BOXING at the Masonic Temple Theatre in Detroit, Mich. The fight was scored 116-111 Smith, 114-113 Bundrage and 116-111 Smith, who became the 48th ShoBox: The New Generation alum to win a world title. In a fight that started slow and was tough to score in the early rounds, Smith (25-5, 11 KO’s) was the more active fighter and took over in the second half of the bout. With Bundrage backing up and mostly on the defensive, Smith moved forward and found success with his right hand. The 34-year-old Smith, a protégé and close friend of Floyd Mayweather, whose Mayweather Promotions promotes Smith, seemed to be the hungrier fighter and fought with a sense of urgency, knowing that he had to capitalize on his first championship opportunity in his 13th year as a pro. The fights will replay SHOWTIME on Sunday, Feb. 24 at 9 a.m. ET/PT, on Tuesday, Feb. 26 at 10 p.m. ET/PT on SHOWTIME EXTREME and will be available at SHOWTIME On Demand from Sunday, Feb. 24 through Saturday, March 23. “Thirteen years, man. That’s all I can say,” said an emotional Smith fighting back tears of joy immediately after the bout. “It means everything. Five years ago I was about to kill myself and I thought about my children growing up without a dad and I didn’t do it. I don’t know what to say. I didn’t think I’d be here. I’m so happy for the opportunity. The 39-year-old Bundrage (32-5, 19 KO’s) was disappointed in his performance in front of his hometown fans. In an interview with SHOWTIME reporter Jim Gray, Mayweather explained his loyalty to his fellow Las Vegas resident. In Saturday’s co-main event, undefeated middleweight prospect J’Leon Love kept his undefeated record intact with a hard-fought unanimous decision victory (100-90, 99-91 twice) over the tough Derrick Findley. After three fairly even rounds, Love (15-0, 8 KO’s), of Las Vegas, Nev., by way of Detroit, stepped on the gas in the fourth and staggered Findley with a series of punishing combinations that opened up a cut under Findley’s right eye. While it seemed as if Findley (20-9, 13 KOs), of Gary , Ind. , barely survived the round, the bulking boxer bounced back and looked to gain momentum in a few of the latter rounds. In the 10th, Love, who was pushed past the eighth round for the first time in his career, kept the pressure on and closed strong with a steady dose of right hands and shots to the body. “It was a tough learning experience,” Love said. “Derrick Findley is a tough fighter, but we asked for Derrick Findley. We asked for a tough fighter. I’d rather have a tough fighter on my resume than some slouch. The 25-year-old Love had his promoter Mayweather also working as his trainer between rounds in the absence of his usual trainer Roger Mayweather for what proved to be the toughest fight of his career. “He knows the experience and he knows what I’m going through so there’s nobody better than that,” Love said. Findley, 28, complained that he got caught with a thumb in his eye early in the bout and that affected his vision. Brian Kenny served as host of SHOWTIME BOXING with Mauro Ranallo calling the action, Al Bernstein and Paulie Malignaggi serving as expert analysts with Jim Gray reporting. The telecast was produced by Raymond Smaltz III, with Bob Dunphy directing. Bundrage vs. Smith, a 12-round fight for Bundrage’s IBF Junior Middleweight World Championship, took place Saturday, February 23 at the Masonic Temple Theatre in Detroit , Michigan . The event was promoted by Golden Boy Promotions and Mayweather Promotions, sponsored by Corona and MGM Grand Detroit and was televised live on SHOWTIME. The co-main event was a 10-round middleweight bout between Detroit ’s undefeated rising star J’Leon Love and Derrick Findley of Gary , Indiana .